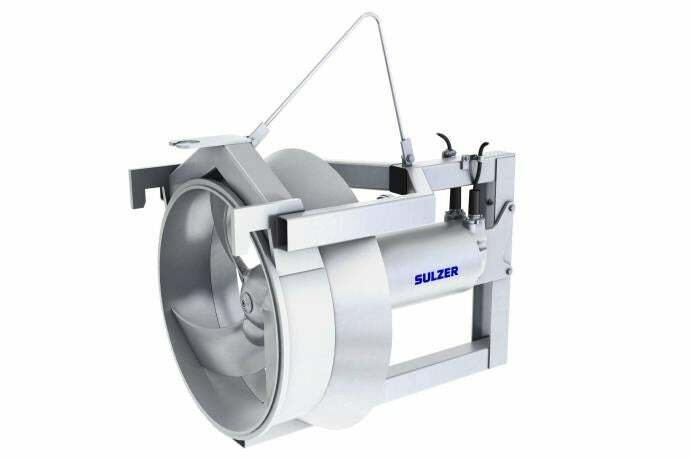 Sulzer’s new pump series is developed for the pumping and recirculation of activated sludge in wastewater treatment plants during the nitrification and denitrification process, as well as for the pumping of storm, surface and river water. It complements the submersible recirculation pump series ABS RCP. The new XRCP 800 PA pump series offers an economical and reliable option for wastewater treatment applications. For the customers, the low-energy consumption of the pump brings savings in total lifecycle costs and reduces the environmental footprint. The submersible recirculation pump type XRCP is designed as a compact, water-pressure-tight unit, including the propeller and bracket. The well-proven automatic coupling system uses a single guide rail and guarantees a quick and economical installation. The XRCP is available in two standard material versions; cast iron and stainless-steel. The maximum temperature of the medium for continuous operation is 40°C (104°F). The XRCP 800 PA series pumps are equipped with a submersible premium efficiency IE3 squirrel cage and 3-phase, 4-pole, 50Hz (60Hz) motors with a power range up to 22kW. Their insulation class is F (155°C). Sulzer’s present submersible recirculation pump series ABS RCP will be maintained in parallel with the new XRCP series for the time being.